Here is our first look at a costume from the remake of Poldark. Thanks to @WinstonGAuthor we know this is a picture of an extra who plays a guest at the wedding of Francis and Elizabeth. The picture comes from Freya Hadfield's Pixsta account Mildemakrel and is captioned: 'And that's a wrap. 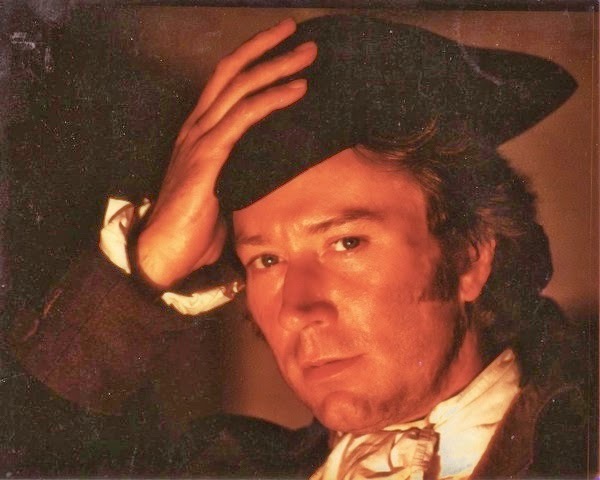 #Poldark' Many thanks to Helen Caroline Biggs @Luthienbono for sharing this on Twitter. 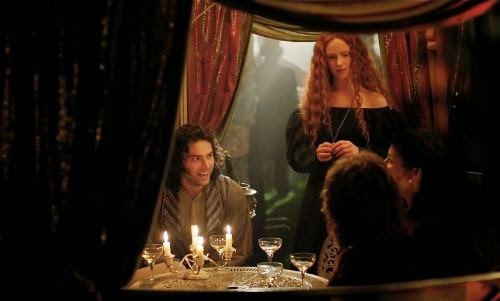 You can read about Poldark's costume designer Marianne Agertoft here. 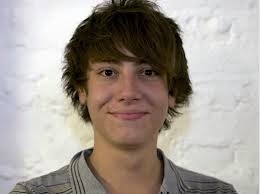 UPDATE: Since writing this Louise Rea, the mother of the twin babies, has confirmed that they are indeed playing Geoffrey Charles Poldark and that they have five days of filming in total. It looks like we have babies joining the cast of Poldark for filming today. Could it be for the christening of Elizabeth and Francis's boy Geoffrey Charles? Here's a great little video about filming with babies on set which just happens to feature Aidan 'I love babies' Turner from when he played Mitchell in BBC's Being Human. Aidan joins the video at 2:58 min. Many thanks to Louise Rea @loopington for news of the baby filming. 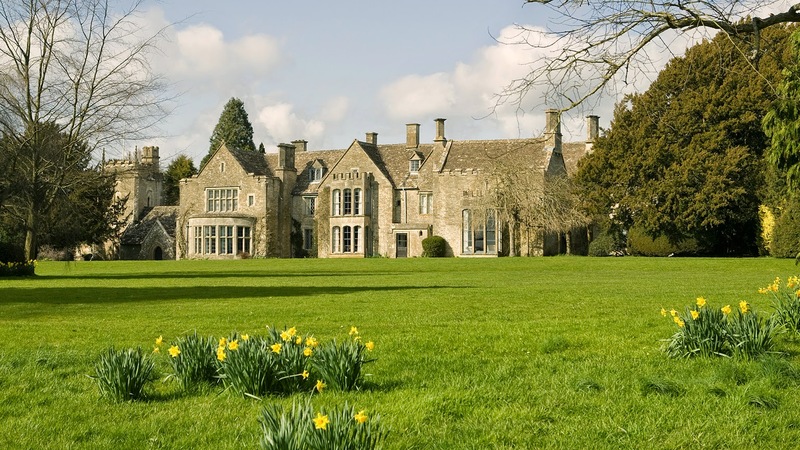 A spokesperson for Chavenage House said,“We are delighted that they have decided to choose Chavenage as one of the main locations in the series. In the 70s there was a run of tried and tested dramas like Brideshead Revisited. It was a golden age of costume drama. 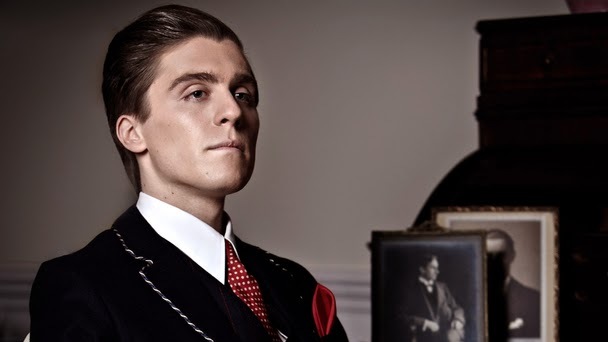 “We now have the success of Downton Abbey and I think the company are looking for the next Downton Abbey. It is perhaps easier to go back to the tried and tested type of dramas which they know work." It also seems that at the end of last week there was some Poldark filming at the chapel at Chavenage too. 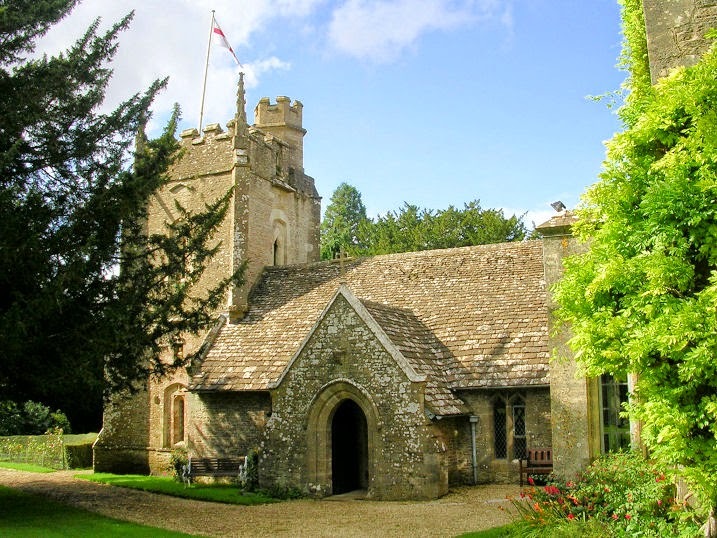 Could this be Sawle Church where Francis and Elizabeth marry? Here's a look at the chapel and its interior. 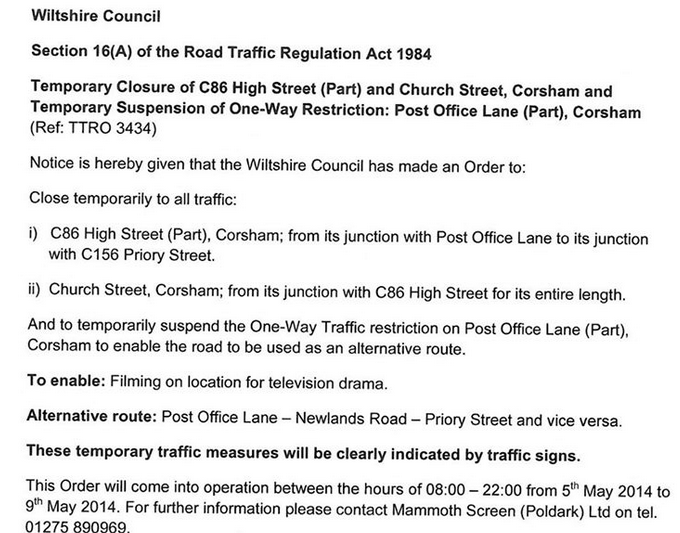 Corsham Town Council have posted a notice about the Poldark filming in Corsham confirming that filming will be on 6, 7 and 8 May, 2014. Regular readers of Poldarked will know that we've been waiting for confirmation ever since we noticed a discrepancy between the dates announced in the press and the road closure notice. 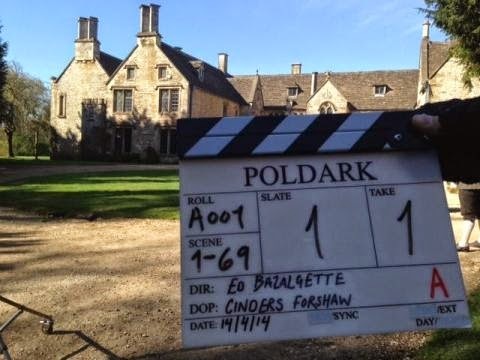 The Director of Photography for filming Poldark Block 1 is Cinders Forshaw. Cinders trained at the National Film and Television School and has a degree in Film and Photographic Arts. Among her many credits are Marple, Poirot and Tipping the Velvet. 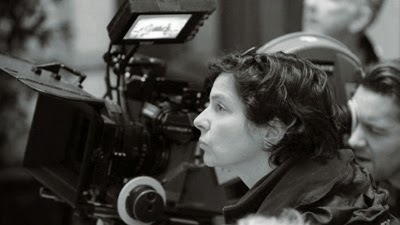 As DOP Cinders has a major creative role in providing a unique visual identity for Poldark. Lighting is key to this as it can create mood, drama and excitement for the audience - largely without them even noticing! Here is a fascinating blog post by Crooning Dog that looks at Cinders' work in some detail. 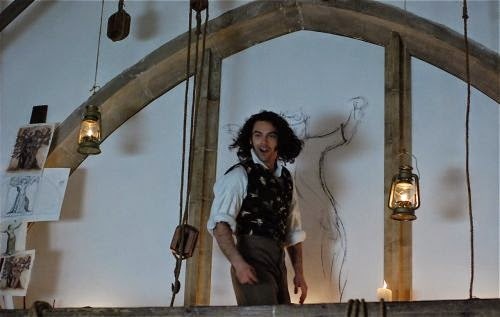 Karen Thrussell, Poldark's executive producer, talks to BBC Radio Cornwall about Aidan riding a horse on the first day of filming, filming in Cornwall in June and July and of filming continuing until mid-September. 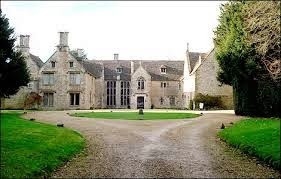 Here's a closer look at the 16th century Cotswold house where they were filming Poldark yesterday. Hot on the heels of last week's casting announcements for Poldark we have a few announcements of our own that we've gathered from Twitter. 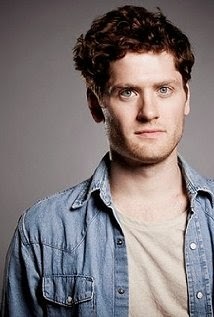 John Hollingworth joins the cast as Captain Henshawe who helps Ross with the mines. John is currently appearing in An Intervention at Watford Palace Theatre. You can catch him there until 3 May . 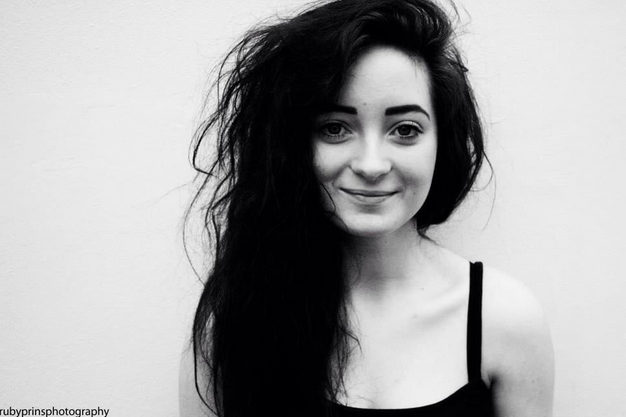 Young Cornish actor Gracee O'Brien has been cast as Jinny Martin. Gracee is with the Cornwall Youth Theatre and has just finished appearing in Before I Wake at Heligan Gardens. 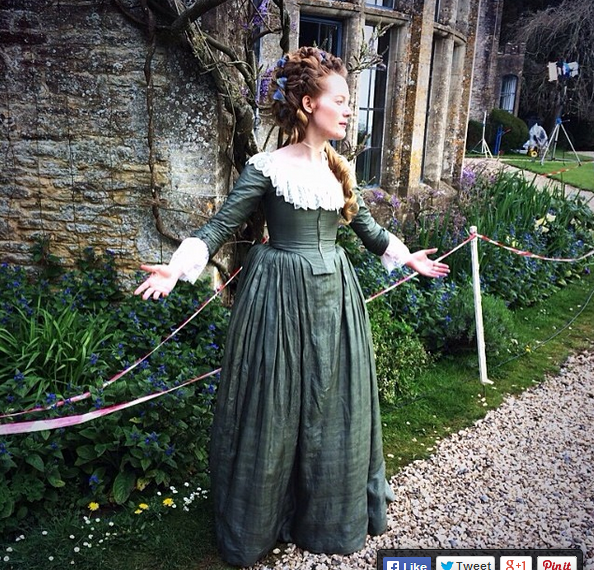 We're waiting to hear what role Harriet Ballard has been cast in but we know she had a costume fitting a couple of weeks ago when she tweeted, "Big Thank-you 2 the lovely costume ladies Marianne, Hava & Jan for corset& costume madness yesterday @BBCOne @mammothscreen #Poldark"
Harriet has appeared in Lewis and Switch. 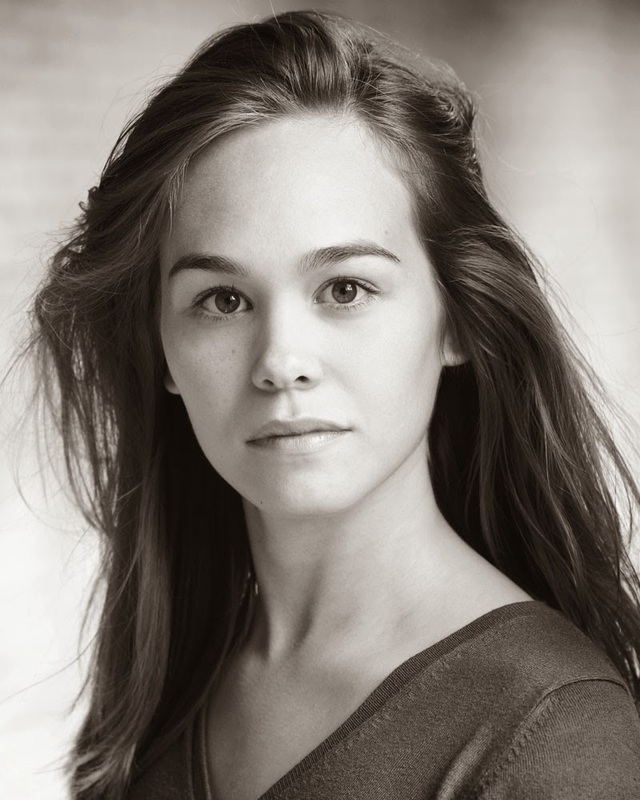 (As a little bit of trivia, she starred alongside Lacey Turner in Switch and Lacey has appeared in Being Human with Aidan Turner). Yesterday it was announced that Robin Ellis would join the cast as Rev. Halse and cast members Heida Reed (Elizabeth) and Ruby Bentall (Verity) were announced a couple of weeks ago. What a terrific cast we have coming together. 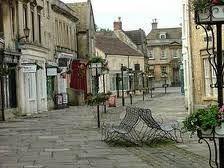 The market town of Corsham, Wiltshire, is to be used as a location for filming Poldark. 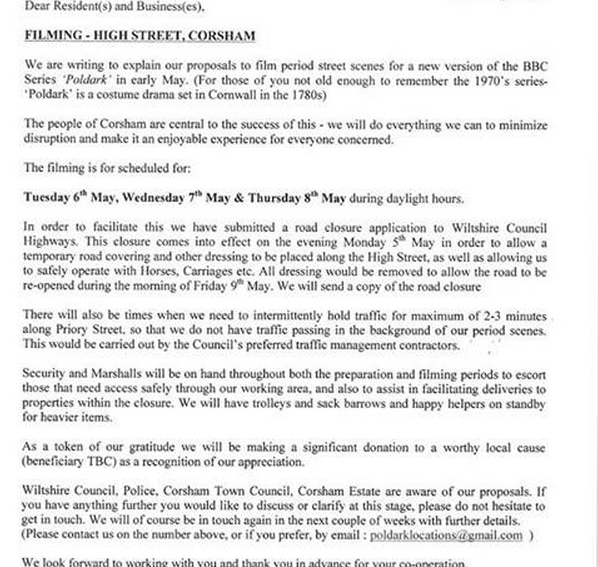 The filming will take place 4 to 8 May and will centre on the High Street and the Town Hall reports the Gazette and Herald. 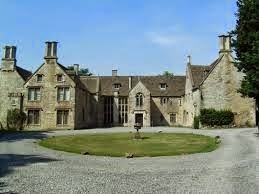 Corsham town clerk David Martin said of the filming, “We are right behind it, as we know it can bring a great benefit to the town, as it will generate a lot of interest. 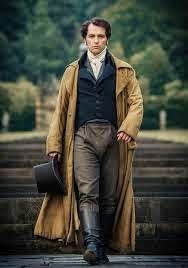 The publicist for Poldark Lisa Vanoli said, “We will be filming in Cornwall for a large portion of the summer and we have studios in Bristol. “They find suitable locations within an easy driving distance of those studios and there are lots of great locations in the area. “There are eight episodes in this series, which will air on BBC 1. One of the stars of the new Poldark drama will, without a doubt, be the wonderful Cornish scenery and many of us will be keen to go there and see it for ourselves. 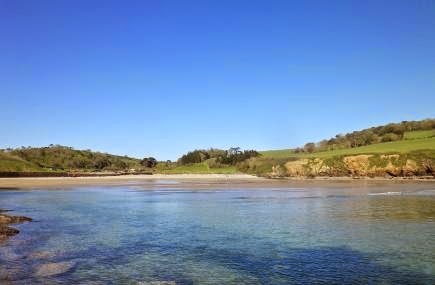 The original series attracted plenty visitors to Cornwall but, with the recent growth in television tourism, Cornwall can surely expect an even greater influx of fans this time around. One of the people responsible for finding suitable locations for shooting Poldark it would seem, is location manager and Cornwall expert Carn Burton. 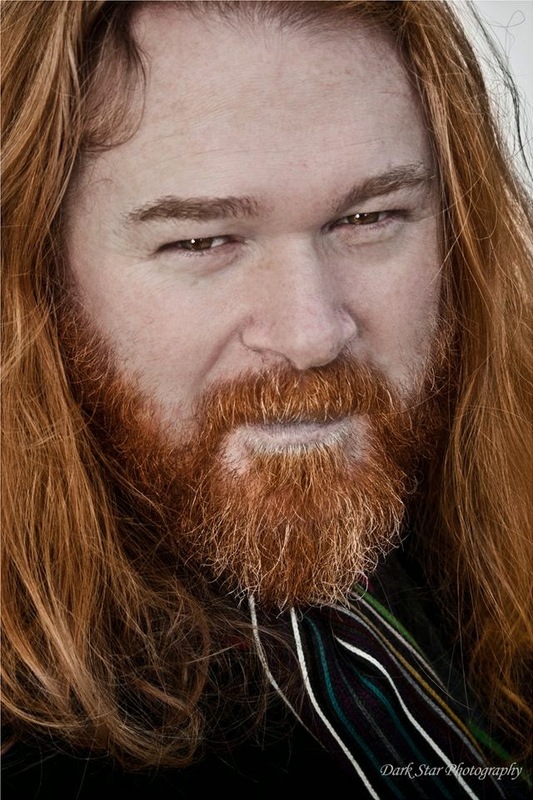 Carn has lots of experience of filming in Cornwall with films like About Time, Summer in February and Gulliver's Travels to his credit. 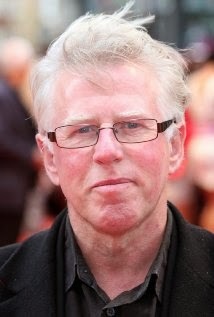 Other credits include Skyfall, Pirates of the Caribbean: On Strange Tides, Rush and War Horse: all pretty impressive. 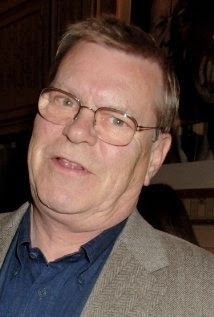 The assistant location manager, Monty Till, is also familiar with Bristol and the South West having worked on Doc Martin and Summer in February. Pictured here are Port Isaac and Porthluney Cove which were locations used for filming in the original Poldark series. 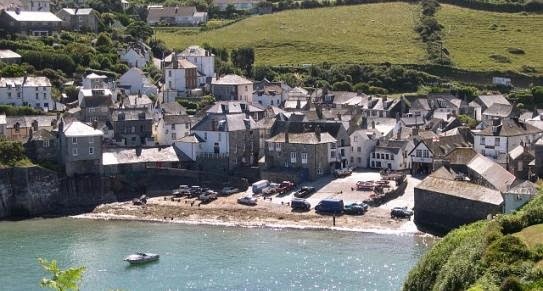 Pictures via Visit Cornwall. 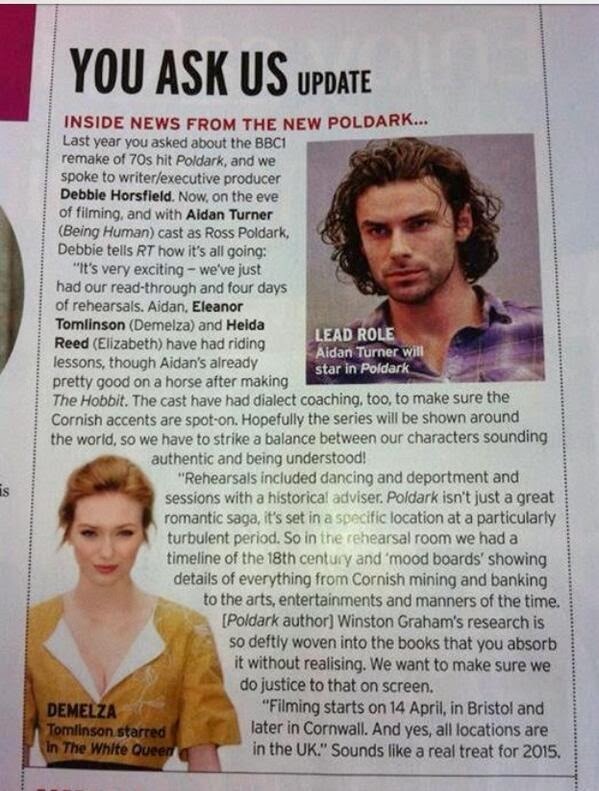 In this week's Radio Times Debbie Horsfield, writer of the new adaptation of Poldark, talks about how the preparations for filming are going. Debbie says, "It's very exciting - we've just had our read-through and four days of rehearsals." 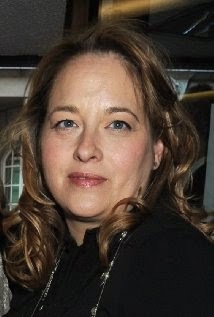 Debbie clears up the question of which accents will be used in the series. It seems that the actors will adopt a light Cornish accent for, as Debbie explains, "Hopefully the series will be shown around the world, so we have to strike a balance between our characters sounding authentic and being understood!" Rehearsals for the cast have included deportment and dancing as well as yesterday's session with historical adviser Hannah Greig. 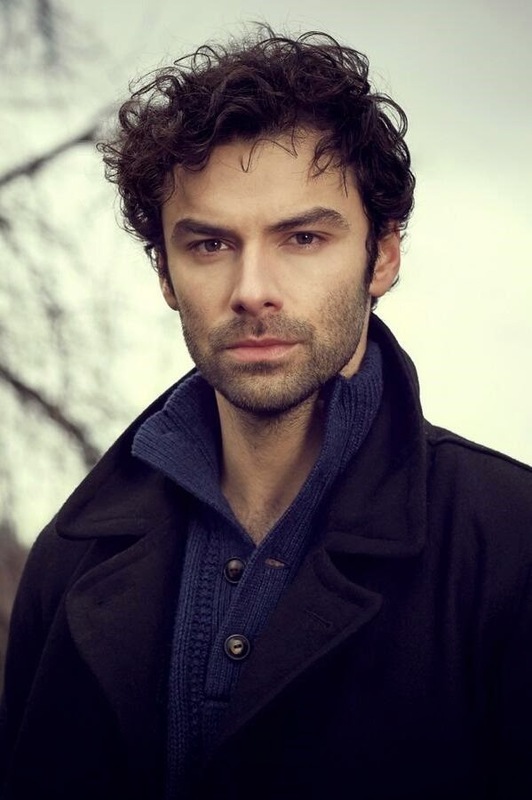 In addition, Eleanor Tomlinson (Demelza), Heida Reed (Elizabeth) and Aidan Turner (Ross) have all had riding lessons. 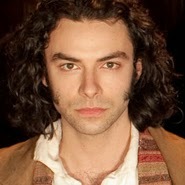 Aidan has some experience of riding having learned to ride for The Hobbit. The dancing, too, should not be a problem for him, having trained in ballroom dancing as a youngster. 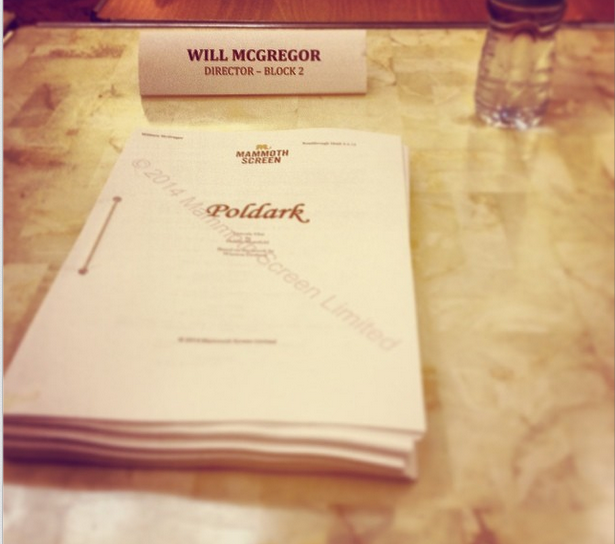 The filming of Poldark starts on 14 April, 2014 in Bristol and Cornwall. Many thanks to @JoyLynne4 for posting the Radio Times article on Twitter. 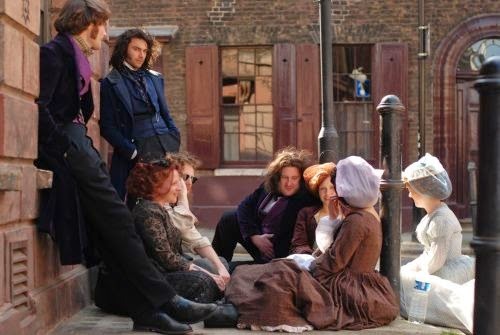 Who doesn't enjoy the costumes in a period drama? 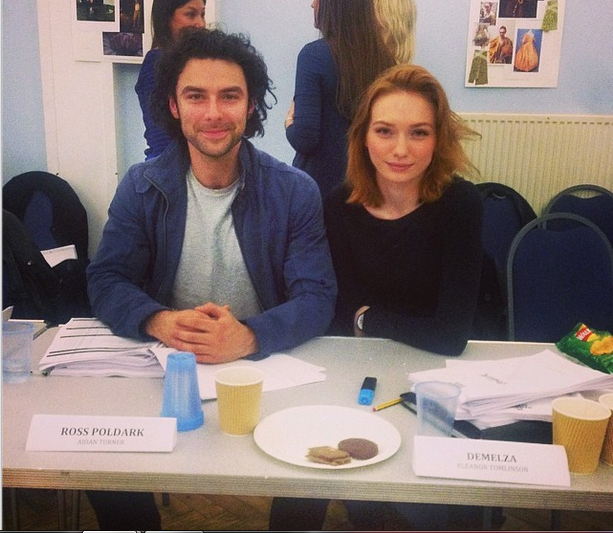 And with rehearsals for Poldark starting in a few days, many of the cast are having fittings this week, it would seem. 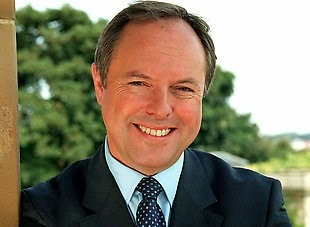 @RobertDaws Off to get my wig and boots fitted for #Poldark tomorrow. Zounds! The costume designer for Poldark is Marianne Agertoft. 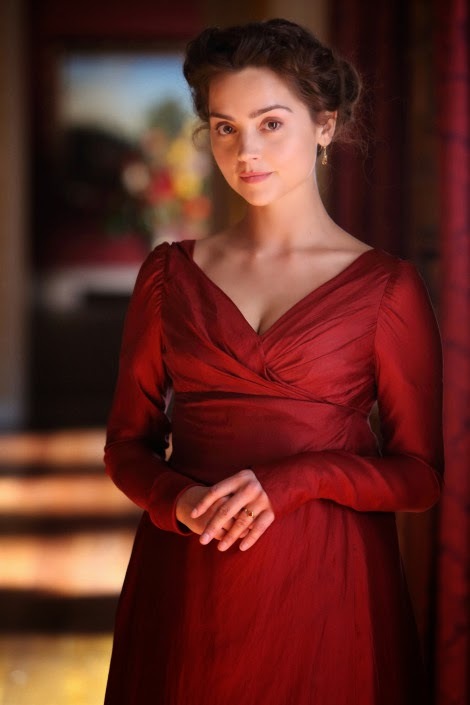 Marianne's recent work includes BBC's Death Comes to Pemberley, which is set in the early nineteenth century. 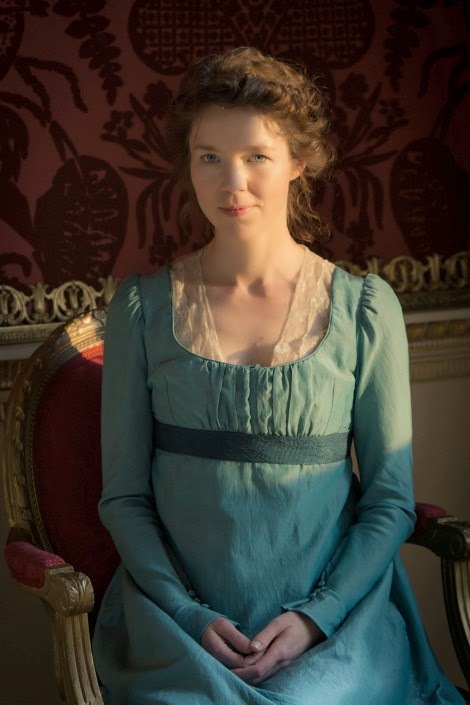 (Of course Eleanor Tomlinson, who played Georgiana Darcy in the drama, will be playing Demelza to Poldark.) Marianne says, "Designing costumes is a collaborative process where you as a designer offer up ideas and then develop the feel and look of the character with the director and the actor." 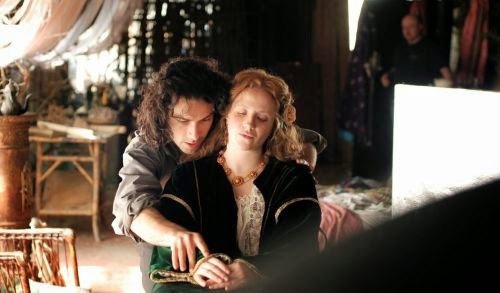 Early in her career Marianne worked on the film Sleepy Hollow starring Johnny Depp. Her more recent work includes Utopia and Late Bloomers. Here are some of the costumes from Death Comes to Pemberley.